The young gipsy couple started their married life by purchasing a waggon. This costs anywhere from £40 to £150 and is obtained from a gorgio waggon-builder. 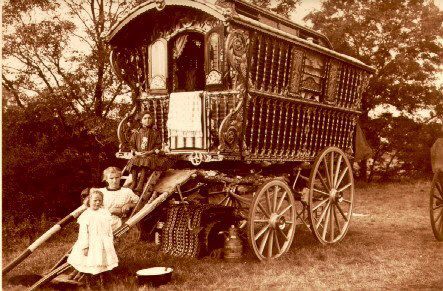 Oddly enough, the gipsies never learn the trade of making their own waggons. The waggons are very warm and very strong, and last a great many years. The young husband is, of course, the manufacturer of the goods, and his wife the seller. When she leaves the waggon in the morning to go her rounds she arranges with her husband where the waggon shall be placed at night, and thither she betakes herself when her day's toil is over. In the course of the day she may have walked from fifteen to twenty miles. If the husband has been refused permission to stand his waggon on the arranged spot and has had to move on, he lets his wife know where he is going by leaving behind him a track of grass. After 1920 the travelling showmen who had toured the country in their Burton waggons turned over their pulling power from horse and steam to petrol and oil and by the 1930's very few of them travelled in the old way. The Romanies still clung to their vardos, although the economics of their way of life was in upheaval due to the contraction in the horse-trading industry and the changes from their traditional crafts to scrap-dealing and tarmacing. While most Gypsies have gone over to trucks and trailers and despite the fact that only about one per cent of the traveller population still live in horse-drawn waggons, the tradition of the vardo is still very much alive as can be witnessed on an annual basis at the large Gypsy fair in the town of Appleby, Cumbria, every summer.